You can buy the digital code, or cd key, for Batman Arkham Knight Harley Quinn Story Pack DLC, the first package of bonus content for Batman Arkham Knight, downloadable from the Steam platform, so you just need to add the cd key into your Steam account that you will receive by email after purchase it. Batman Arkham Knight Harley Quinn Story Pack DLC offers the possibility to play with the character of Harley Quinn and use their unique weapons, gadgets and abilities against all kinds of super-villains that are invading the city of Gotham. Batman Arkham Knight is the latest title in the Batman saga, which embody one of our favorite heroes, with which we will face the most charismatic villains of the Batman universe. One of the most interesting in this installment of Batman, which marks the end of the Arkham series, is we can drive the Batmobile with a unique design of Rocksteady. Remember that all stores appearing in gocdkeys have been checked by our team, so they are 100% reliable. 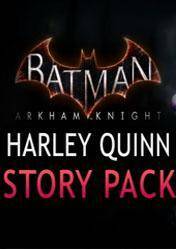 There are no comments yet about Batman Arkham Knight Harley Quinn Story Pack DLC . You can be the first one!